Out of all the typhoons I've witnessed, Typhoon Ondoy has made the most impact on us. Being a resident of Marikina City, we're accustomed to floods during the rainy season. As with other residents, we have our own set of protocols when we're expecting flood waters to rise. All our sofas and chairs are placed on top of wooden tables. Everything on the ground is placed on higher shelves. All appliances are unplugged and our main power switch is shutdown. Candles, matches, batteries, and flashlights are all checked and made sure that they are easily reachable when needed. And whatever food, water and goods we can use to eat and drink is saved and placed upstairs in case of emergency. There are lots of other minor details we follow and most of the time, the water just goes up to knee level which in our experience, is not very detrimental. Of course it's saddening and we all know that when the floods subside, there is a whole lot of cleanup that follows. But it's feasible. What happened with Typhoon Ondoy is one of a kind. Never has the rains poured non-stop and in an extremely alarming amount. Never has the flood water rise so high in a short span of time. And so even with all the precautions and preparations we had, we were totally caught offguard. The floods in our house rose to an all-time high and a 1st for us, at five feet deep. And by this time, eveyrthing started floating. Walking your way through floating obstacles in shoulder-high waters is not an easy task. How much more difficult would it be for our less fortunate victims of the flood who have experienced deeper waters with nowhere to go. After the storm, people were left hungry, homeless, sick and weak. Thousands of families suffered heavily from the floods. It's a good thing that many have heard of the devastation and destruction Typhoon Ondoy has left. Victims needed help and there was an enormous population of victims to cater to. As a result, several groups, organizations and volunteers emerged to adhere to the victims. One of those groups who have offered their unconditional support is the Lopez Group of Companies. Called "Sagip Kapamilya", they called on everyone to donate in cash and in kind. Backed up by ABS-CBN's vast media resources, they were able to conduct a nationwide call for donations and in such a short amount of time, they were able to collect millions which was being constantly used to buy relief goods for victims. 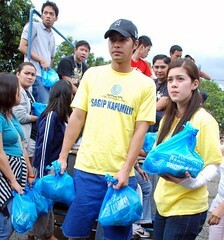 Even ABS-CBN personalities and celebrities actively helped first hand in delivering relief goods to the typhoon victims. Thanks to Sagip Kapamilya, you see the nation becoming one. Kudos to their relief efforts. On behalf of my fellow city citizens, salamat sa Sagip Kapamilya from Marikina. For updates on cash and kind donation totals, check out their Facebook page or their website at http://www.lopezlink.ph.